How to help employees be passionate about their jobs. Profiles of Oregon software executives and employees who are partners in love as well as business. 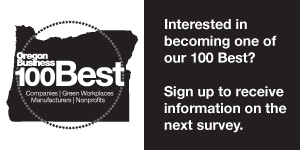 Oregon Business readers respond to Breastfeeding Mothers Continue to Struggle in the Workplace. The resounding response? New parents need family leave. Breastfeeding still at odds with workplace norms in the U.S.